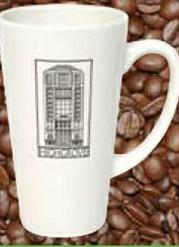 Get a double shot of brand exposure with promotional coffee mugs. Branded coffee mugs have an advantage over some other promotional products because they’re often used daily. This functionality drives your message home on a regular basis. Personalized coffee mugs have the potential to make a big impact in your brand. After all, who doesn’t love a great mug for their daily coffee or tea or most anything else? Custom mugs are one of the best items to brand, and for good reason—they’ are durable, classy, and have widespread appeal throughout many industries! BRAVA’s selection of shapes, sizes, styles, capacities and colors guaranteed to fit your company’s taste. They are a perfect budget-friendly buy for stocking your break room. Use them as giveaways to generate leads and strengthen current relationships. Add tasty treats to transform our mugs into thoughtful thank you gifts. Insert gourmet coffee, candy, cocoa, cookies or candy for a custom gift that keeps on giving. Guarantee a spot at any table with BRAVA’s custom mugs. Your brand shouldn’t have the same mug as everyone else, so look to BRAVA Marketing to have the best selection of different mugs that will make your brand stand out. If you’re looking for an item that recipients will hang onto and appreciate, look no further than personalized coffee mugs! Easily print your logo on them and spread name recognition. Everyone has that favorite coffee mug, which is why creating custom coffee mugs for your organization and business is always a good idea. 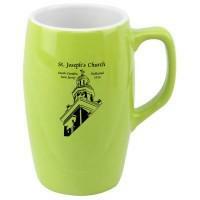 We carry a variety of promotional coffee mugs, from travel mugs and tumblers, to the tried and true desk mug. Engrave and start personalizing today! Visit BRAVA Marketing today to find the perfect mugs for you and your brand today! To check out all of the different mugs available and how to customize them, click right here. Don’t worry, there is one for a cup holder of any size!